July 18, 2018 5:00 P.M.
Meeting was called to order by Mayor Brian Linin with Vice-Mayor Jay Dee Brumbaugh, Commissioner John Garcia, Commissioner Annette Fairbanks and Commissioner Jacque Schields responding to roll call. Also present from the City were Rich Simon – Director of Public Works, Dustin Bedore – Director of Electric Utilities, Joni Showalter – Police Chief, Brian James – Fire Chief, Mary Volk – City Clerk, and Andrew Finzen – City Manager. Tamara Hayes stated, I am Corporal Hayes wife and want to provide the Commission a perspective from the wife of a police officer. I would ask Commission for proactive enforcement instead of criticizing the statistic for increased traffic stops. Not following State and Local laws is not right. The Police Department does not have personnel to be pulled off their current job. Some officers work alone or additional hours on time off. Sometimes one of your officer’s is the only officer on duty for Sherman County. OSHA standard requires the employer provide a safe work area. I recommend adequate staffing so the officers are not working alone at any time. Goodland crime statistics are higher than 59% of Cities in the U.S. The department has seven officers, a Chief and an Investigator, which equates to one officer for over six hundred people. Goodland is below average in number of officers it provides. You cannot focus on economic development without looking at these factors which affect economic development. Drug violations have increased with new Colorado law. While I am glad the college is growing, it has kept the department busy. The Officers signed up to protect the City when no one else will; the Commission needs to be responsible and create a safe environment. It appears Commission is putting money ahead of lives. It is in the best interest of the Commission to protect every single citizen. 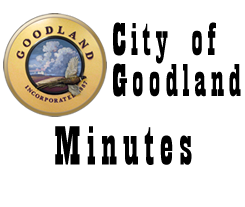 We cannot just think it will not happen in Goodland because times have changed and it could be a situation that Goodland experiences. Jason Showalter stated, I want to talk about my family, not just my wife, but all those that wear a badge. In today’s society where officers are being killed for nothing more than wearing a badge, I expect and demand the officers be protected and properly trained. It does not matter what we have in Goodland if officers are not protected. You cannot have them worried about whether they keep their job. When they come to the City Building they should know you have their back. As a citizen and spouse, I demand you take care of them. Perry Baird stated, I have been a minister since 1991 and work for school system. As a concerned citizen, I have four immediate families in Goodland. Many officers in the department have visited one of my homes for one reason or another. We discuss from time to time if there are too many officers. That has never crossed my mind, what has is the fact that we have too few officers. They do small things to help people; they are not just issuing tickets. The increased police presence causes crime to go down. I would like to see the City be proactive to prevent a catastrophe or be prepared for it. Do not be behind the eight ball it when it happens. Citizens need peace of mind to know someone is watching out for them. FY19 Budget – Andrew stated, I am providing Commission changes made to the budget from the motion at the July 12th meeting, adding the SRO position. Commissioner Fairbanks stated, we made our decision the other night, not sure why we are discussing this again. I suggested we sleep on it but everyone appeared good with decision. I made a motion, with an amendment I was asked to add, and everyone voted for it but Mayor Linin. I respect he voted for what he felt was right. I feel the SRO can help the department out and do not feel an existing officer can be taken off shift for position. Maybe Ben Schears from the college should be involved since the college is growing. I stand by our decision last meeting. In front of school officials, all of us said we feel good about an SRO. Yes, it was last minute, but we assured them that was not an issue. I feel we need to stand by our commitment. Commissioner Garcia asked to address both the constituents and Commission. I feel Andrew brought a good budget the first time. Commissioner Fairbanks even stated she would forego additional officer to ensure all employees get raises. I left meeting the other day and felt if SRO discussion started in April it was unfair to bring it to Commission at last meeting. I agree with everything that has been said, but I challenge anyone to show us where we can drop the budget $300,000. All demographics show our revenues are going down, look at the electric fund. If going to survive as a municipality, we need to start cutting. We live in an emotional world that will not change with media prompting division in world. We can justify anything we want to; we have a tough job to do, but if anyone can find a place to cut, I challenge you to look at budget. In the first budget presented Andrew said we cannot afford raises. Commissioner Schields was in favor of an officer but not raises. Commissioner Schields stated, I felt that way if insurance premiums increase 15%. Commissioner Garcia stated, we could have a disaster occur and not be able to turn community around. We can find money if we are like other communities and have employees pay a share of insurance. We have to live within our means. I called this meeting because a lot of decisions were thrown at us. We can cut programs, but everyone has to take ownership. Tamara asked, were cuts made across the board. Commissioner Garcia stated, yes we cut about $800,000 from budget. I believe in protecting our children but where does additional money come from? Tamara stated, drug violations have increased, you have to keep a safe environment for community. I would not move my children to this community. Commissioner Garcia stated, people are driven to your community by low utility rates, low taxes and good infrastructure. Tamara stated, I disagree, they move to your community for a good education, a safe environment and good hospital. I would like to see Goodland grow, but you have to make it safe. Commissioner Garcia stated, they do need protection; I do not know where the answers are. Commissioner Fairbanks stated, I would like to clarify Commissioner Garcia’s comments. I was not in favor of a new officer but when I found out we did not have raises in budget, I felt we needed to take care of existing employees with raises. When the SRO was presented, I felt it would help both the school and department. We voted to hire an SRO on a cost share basis with school district. I know it is not what department wants but feel it will help. Jason Erhart asked, I do not know how much Commission makes but why does the City of Goodland not have three Commissioner’s instead of five? Mayor Linin stated, it is a Charter Ordinance to have five Commissioners. I feel in working with County, it is hard with three Commissioners. Commissioner Schields stated, I felt same as Commissioner Fairbanks the other night. However, I was in favor of another officer but knew it would not work within budget but feel the SRO is a good patch. I am still in favor and do not know why we are visiting this again. Jason Showalter stated, when I was at the Sheriff’s Office I understood the Commission had a tough job but also felt what the officers did was tough. I would invite you to ride along with an officer at night to see what they face. I get frustrated that no Commissioner ever rode around with the Sherriff’s Office to see what they put up with and why it is an emotionally charged subject. Tamara stated, I appreciate you working to make it easier for the officers and ask you to keep in mind they are under staffed. Joni stated, our ride along was instituted by Chief Couch. Andrew and I talk all the time about building relationships between the Commission and Department Heads. Terri Baird stated, being a wife, mother and grandma we have had a rough time in last year and was unaware how rough the police have it until I had to experience a domestic situation with my daughter and her family. I am thankful I can call them when I need to for my family. Tamara asked, do officers already visit schools? Jason Erhart stated, when we can, but on busy days we cannot all the time. Joni stated, we do when we can and would like to more often. We would take Flex up there and do walk around so the students felt comfortable with police department. It is the opportunities we take advantage of outside our normal job so citizens see us as people. Vice-Mayor Brumbaugh stated, my question in discussing traffic stops was that it was an increase and I look at variances and trends. My question is if you are asking for another officer but increasing traffic stops, we might need to look at time allocation and putting officers where they are needed. I want safe streets and safe schools. I did not know of need for our school to have SRO since not in any previous discussion. I feel education and relationships with students is important. I understand the grant dictates that SRO must be a fulltime position and I am not in favor of pulling officer from existing staff. Coming into meeting I did not feel I had knowledge of SRO to be in favor of it. With revenues decreasing, I do not want to be in a position where raises are not given. Tamara asked, what is increase in insurance? Mayor Linin stated, we budget 15% but will not know where it will end up till later in year. Tamara stated, that is a raise, the officers are tired and always called in on days off. They know what they have to do and are always willing, but they are tired. I do not expect you to build Rome in a day. Jason Erhart stated, most of the increase in calls are citizens that need to be educated. Joni stated, I have thought a lot about the increase in calls, we have a lot of calls regarding people racing around their neighborhood; it is education. Jason Erhart stated, we also participate in seatbelt awareness. Vice-Mayor Brumbaugh stated, my comment was not in negative context. Tamara stated, they need to feel appreciated and that the Commission has their back. Commissioner Garcia asked, do we have anything else in budget we want to discuss? Mayor Linin stated, I left last meeting pretty frustrated but it was not because of the SRO. We spend a lot of hours going through budget process and every year we have special meetings and in the eleventh hour we approve the same budget that does not help any department. We try to plan for the future but we all agree it will not work with population declining but the budget continues to grow. Somewhere we have to make a change. I do not feel it will end well for us. The Federal Government has been doing it for years. I was in favor of taking SRO from existing staff because it was simple, money is not there. It was one department where the budget has grown the most over the years. I am in agreement with everything said by our citizens tonight and keeping a safe community but the way the budget is it will not continue to work. If cannot grow revenue need to look at cutting expenses. You can look at departments that have cut in past, but police budget has grown. It is hard to say how many officers need and what need to feel safe. That is why I voted the way I did. Commissioner Fairbanks stated, we have talked over the years what it would take to increase the mill. We looked at an example last meeting for one mill increase and it came down to $10 extra in property taxes. We are trying to operate on shirt tail to make community work with budget. It is getting difficult to continue to play balancing act without increasing taxes. We are not even keeping up with the economy. Mayor Linin stated, but the value of our mill has increased over the years so we have more money to work with. Vice-Mayor Brumbaugh stated, instead of passing increase on to tax payer we were able to find within the existing numbers. I do not want to be in situation if we do not grow we could be in trouble. I can live with decision we made last meeting. I am confident with numbers we have to work with. I can live with SRO as long as it is not pulled from current staff. Our decision is whether we want to fund position. Commissioner Fairbanks stated, we found a way to make it work at last meeting within our budget. We need to look at budget situation over next year. I do not understand why we are revisiting this to change the decision. Andrew stated, sales tax provides a lot of opportunity to this City. There is a recent court ruling that internet sales are applicable to sales tax. Sales tax can be used for some of the things we need to address. Commissioner Fairbanks stated, the sunset for existing sales tax will help and we need to stay on top of it expiring. Commissioner Garcia stated, it will be up to tax payers if it continues. Commissioner Fairbanks stated, I feel it is an easy sell since nothing changes. Vice-Mayor Brumbaugh stated, it is easier with sales tax funding because of interstate assistance. Andrew stated, we do not know how election will go but some candidates are in favor of reducing state sales tax. Vice-Mayor Brumbaugh stated, with our last vote on budget I did not feel we had time to review; wished we would have taken the time. I want to stand with where I was before on my vote, keeping same mill levy without SRO. If we make changes again without the SRO I would vote that way again. If there is time to make changes, we need to discuss now. Commissioner Fairbanks stated, we did what was asked of the Commission. Commissioner Garcia stated, I understand what Vice-Mayor Brumbaugh is saying; there was a lot thrown at us that night. We already have a program visiting our schools. Mayor Linin stated, I feel we are kicking the can down the road because we do not have a budget that works. Commissioner Schields stated, you pick your battle, there were things I did not like but this was feasible; we made changes to get SRO. Vice-Mayor Brumbaugh stated, after meeting with County Commission, Economic Development is a big budget number but we have opportunity to do something in future with County to save money. That will be a win-win for everyone. I really want to focus on that moving ahead. ON A MOTION by Commissioner Garcia to approve publishing the budget as presented at the start Special Commission meeting July 12, 2018 which included 2% for employee raises but not the SRO position since we have a program in place to visit schools seconded by Mayor Linin. Commissioner Fairbanks stated, I do not see necessity and I feel this is bad business. I am disappointed in Commission. Vice-Mayor Brumbaugh stated, you were not in favor of additional officer at the cost of existing employees not receiving raises until the SRO position was presented. Commissioner Fairbanks stated, the SRO was a way to help the situation where it was a 50/50 cost share with the school. I trust the department heads to run budget; it does not solve problem but it helps and we found a way to fund without adding to mill or increasing taxes. We need to dig into budget numbers throughout year but I stand by our commitment to the school at our last meeting. This is not a lot of money and no one has been hurt by decision. I feel we should look at it for a year. If we find we were misled, then I feel we need to address it again but I do not feel that is what has been done. Commissioner Schields stated, I agree with Commissioner Fairbanks, getting an SRO is not the program we have now where they visit the schools here and there. It is a cost share with school. MOTION carried on a VOTE of 3-2 with Commissioner Schields and Commissioner Fairbanks casting the dissenting votes. Mayor Linin stated, we need to understand what needs to be published. At start of the July 12th meeting Andrew presented the mill at 50.02 with 2% raises in the budget. The question is either need to discuss changes wish to make or vote to approve for publication. Commissioner Schields asked, would you revisit changes suggested tonight to consider the SRO? The budget at beginning of July 12th meeting was the same money with modifications to get an SRO. Only changes made were within line items. Vice-Mayor Brumbaugh stated, I want to work with County in some areas like we do in Fire Department, which is what we need to do. This is working with school but it added to police budget. I want to ease pressure on both City and County to fund all things. Commissioner Schields stated, we added the SRO, but no money. Vice-Mayor Brumbaugh stated, at last meeting I was not adding another person. There was no urgency and it was not on anyone’s radar. I have done my research and talked to many people, even police officers. They thought they would rather leave way it is than to add officers. We should not have voted on it. If it is that important, we need to discuss it. I feel it is more education and building relationships, but at the end of the day I did not feel it was right. Commissioner Fairbanks stated, if we made a mistake we made it but as a Commissioner, it destroys our integrity because we found the money to fund SRO. We made a commitment and now have backed out of it. It does not send good message to our community. I am disappointed in Commission because there is no reason we are backing out of our decision. I do not expect someone else to make a promise to us then back out on it. Mayor Linin stated, I agree with what you are saying. It is not too late to do what you feel is right. Commissioner Fairbanks stated, voting to put on a new officer will not pass if you do not agree on a part time officer. I feel our decision helped with public relations the other night because we helped the department and the school. We are going backwards with this decision and it will be more harm than good. Commissioner Schields stated, I agree. Commissioner Fairbanks stated, we went back on our word we need to move on. Vice-Mayor Brumbaugh stated, we could have made changes after publication. Commissioner Fairbanks stated, I would have felt better about that than going back on our word, that hurts us. We voted on it and it passed; however, I do not feel this is the right fiscal thing since we found the money. Commissioner Garcia stated, we have to think down the road, not live for the current time. Mayor Linin stated, I have said if we were going to make a change it had to be people based. Commissioner Fairbanks stated, this is an effort to bring our community together for a small amount of money. It will not prevent a school shooting, but it helps with public relations and the department. Yes, I agree it was brought to us at the last minute but we just needed to decide if we were in favor of it or not, I was in favor. This issue in budget is very bothersome. Vice-Mayor Brumbaugh stated, I voted first time for a reason and thought had consensus, after having more time to research I still do not feel it is a burning issue. Given the opportunity I might think different. I do not like it either way. For the integrity of this Commission, I do not know if we are out of line by our vote tonight. I feel I have more information with this vote. Commissioner Fairbanks stated, this is a $32,000 item not $250,000 so if you could have lived with it either way why are we going back on our word. Bill Biermann Superintendent of USD 352 stated, if the $32,000 is the issue, I can approach my board about a 75/25 cost share. We do not like surprises at our meetings either but we have been discussing the SRO for some time so my board was not surprised. If you agree to cost share, the motion will have to be contingent on my board approval for one year to get your issues worked out. Doing the math, we are in school 171 days so it works out two-thirds, one-third share. Vice-Mayor Brumbaugh stated, the paperwork was dated 2013, why is that, have you been discussing this that long. Bill stated, that was draft we were working with when we were approached by Chief Couch. Vice-Mayor Brumbaugh asked, outside of education aspect, do you feel an SRO is important for safety in school? Joni stated, the point of an SRO is to be there and prevent urgency, provide education to try to keep something from happening. It is not a reactionary position. Bill stated, I did not talk about safety of our schools. This is not preventative. Yes, we need for school safety; as a Superintendent, I go home every day with a sigh of relief that nothing happened. So yes there is a sign of urgency, but that brings emotion into subject. Vice-Mayor Brumbaugh stated, I want this kind of communication, to get the information. Bill stated, the biggest issue now is every time we need an officer, it is a different officer that may not be aware of situation. Vice-Mayor Brumbaugh asked, the grant is for a full time position, is that for twelve months or when school is in session? Bill stated, it is while school is in session; we will use the officer 171 days per year, the City uses rest of year. Vice-Mayor Brumbaugh stated, so it is a year to year situation. Andrew stated, we discussed the SRO in April and Joni and I discussed presenting during budget if funding panned out. Funding for the officer did not come to fruition until late and Bill contacted me day before last budget meeting. Sometimes it happens that way which is unfortunate. The reason I put a full time officer in budget is because I see need for the officer due to burnout and employees being called out on days off. That is reason I made cuts I did. Without feeling like we are kicking the can down the road, we have provided information for a full time officer, not an SRO. That does not change issues with department. Commissioner Garcia stated, if you are serious about this issue, one officer will not be enough, you need three. Where are you going to cut that much to make the budget work? Commissioner Schields asked, why start with three, start simple to see what we need in a year. Andrew told you we needed a full time officer we ignored it. Then we have an opportunity for an SRO on 50/50 cost share to help department. You want input, they have given it to you but you have chosen not to listen to it. Bill stated, when Chief Couch and I wrote COPS grant it was a 75/25 cost share, but we asked for 50/50. Andrew stated, implementing the SRO is a significant change for department to help improve staffing and moral. Commissioner Garcia stated, this same proposal was presented a year ago with no demographic change and no one was in favor of new position, what has changed? Commissioner Fairbanks stated, it was your suggestion that I amend my motion last meeting, plus the opportunity of an SRO. Commissioner Schields stated, we will have a moral problem with police department. Jimmy McKinney police officer stated, I moved here so I am new kid on block. I moved because I did not feel appreciated and moral was low at my previous job. I took $24,000 pay reduction to move here but kids will tell an SRO something they will not tell a normal officer. Will we prevent fights and shootings, may not but you hope we can prevent or eliminate parts of the situation. I was an SRO; do we need it? It is good to have. The 1,500 traffic stops you are discussing deter crime too. If you have opportunity to put a preventative measure in your School, why not do it? It happened in Garden City last weekend so it is close. The other night you had an officer that almost had a gun pulled on him. I pray your decision is because of money and not something of ill will toward the department. If they are financial issues I feel you need to sleep on it. Please just do not vote this down immediately. Commissioner Garcia stated, nothing we decide here is because of the department. We appreciate what you do that is why I feel you need to run two officers at night. How many officers do we schedule during day? Joni stated, I have one plus a swing shift employee to help officers get reports done then I fill in where I can. But how much can I work. Tamara stated, the officers need time off and now you only have six officers because there is one at academy. The schedule now is the best they can have for the number of officers have now. Jason Showalter asked Vice-Mayor Brumbaugh, does what Bill discussed change your mind? Vice-Mayor Brumbaugh stated, I have received a lot of information that I have considered. Commissioner Fairbanks asked, are there statistics that show students talk to SRO about stuff they would not otherwise report? Bill stated, I do not have statistics but it is based on relationships being built, from the teachers to the coaches. Jason Erhart stated, school shootings are up 56 %. Jimmy stated, statistics do not tell you how many school shootings are stopped by having an SRO. Vice-Mayor Brumbaugh asked Commissioner Garcia, does the 75/25 cost share change your mind. Commissioner Garcia stated, there is no question it is imperative and needed. Bill has shed some light on it, but I would like to sleep on it. Will it relieve issues with the department? Joni stated, it will help. Bill stated, the MOU is written that if Joni needs the SRO they report. Vice-Mayor Brumbaugh asked, can we change our mind with information presented? Commissioner Schields stated, we have found the money, it is a one-year commitment. Vice-Mayor Brumbaugh stated, if the school board approves the 75/25 cost share, for 25% it helps the integrity of Commission. Commissioner Schields stated, we are using officer basically same amount of time. Jason Erhart asked Mayor Linin, what would it take to get you on board. Mayor Linin stated, I have made it clear where I stand on this budget. We need change to make budget smaller not larger; I have thought this for six years. Tamara stated, with 171 days at school, City can only use officer 89 days because you remove weekends. Commissioner Schields stated, we made it so that the 50/50 cost share would work. Vice-Mayor Brumbaugh stated, I am open to what we decided at the meeting July 12th, but would like to think about it. If it is $16,000 and the safety of our students. Consensus of Commission is to have a special meeting on July 19th at 6:30 p.m. Bill stated, I will not be at your next meeting and will be understand your decision. I want you to understand if you want the 75/25 cost share and my board agrees to it, it will only be for one year, not long term. ADJOURNMENT WAS HAD ON A MOTION Commissioner Garcia seconded by Mayor Linin. Motion carried by unanimous VOTE, meeting Adjourned at 8:00 p.m. The next Special Commission Meeting is July 19, 2018 at 6:30 p.m. and the next Regular Commission Meeting is August 6, 2018.